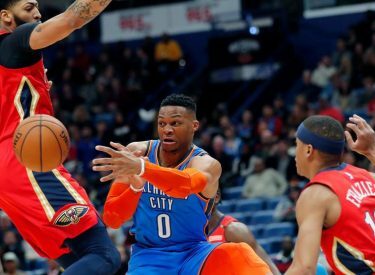 NEW ORLEANS (AP) – Anthony Davis had 44 points and 18 rebounds and the New Orleans Pelicans narrowly held on to defeat the Oklahoma City Thunder 118-114. Jrue Holiday had 20 points and 10 assists. Julius Randle added 22 for New Orleans. Paul George had 25 points and 11 rebounds for Oklahoma City. Dennis Schroder scored 24 and Russell Westbrook 20. The Thunder’s Alex Abrines missed a 3-point attempt for the lead in the final seconds.